I’m always cold in the Bay Area, so instead of wishing the weather to be warmer by wearing lightweight cotton dresses, I have decided to be more practical and start making things in flannel and wool. 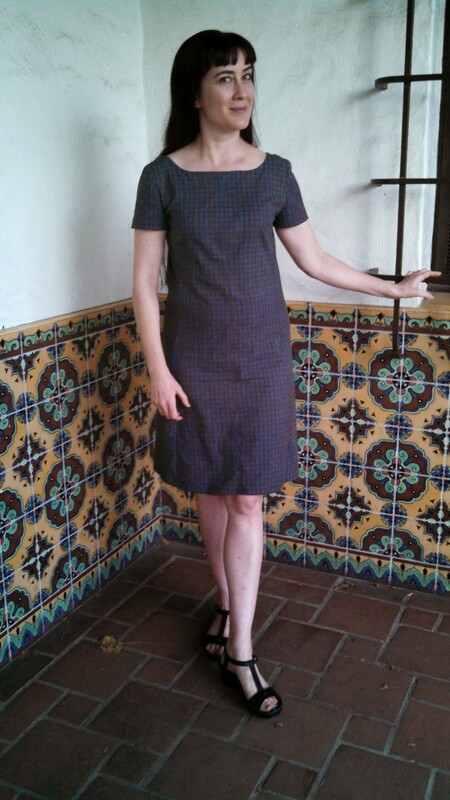 This dress is a wearable muslin I made from an inexpensive cotton flannel that I had in my fabric stash. After wearing it a few times, I am afraid to wash it since it already has several nicks where the thread has pulled through the other side. I wore it on a chilly night in San Francisco, and I was still cold even in a heavy parka. But cotton flannel is still heading in the right direction, so I think that the next few things I make will be flannel. This wearable muslin has served its purpose of being a practice garment for fitting, and I will certainly wear it again, if it does not disintegrate when I hand wash it. Front, vintage McCall’s 2481 in cotton flannel. There was a time when the majority of my dresses were A-line and modish, and I am thinking of making more of these. This dress has some of my favorite features: a scooped boat neck and A-line. It is one of the fastest things I have sewn recently, and the simplest pattern. What do you think? Maybe the sleeveless jumper with the cut-out in a solid color flannel, to be worn with a long sleeve high neck shirt under it? Or two-toned color blocks made by the princess seams, the sides a darker color? 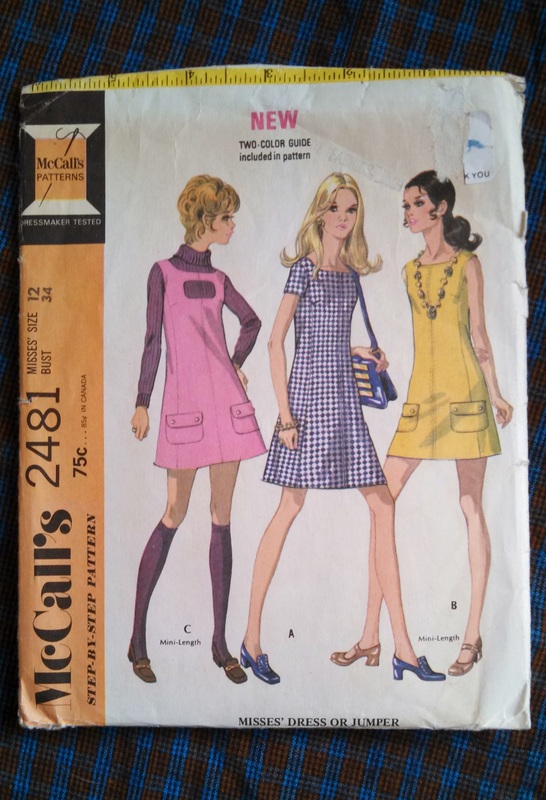 Vintage McCall’s 2481 sewing pattern from 1970. I would fit this dress slightly differently next time, and make it a little larger all around. 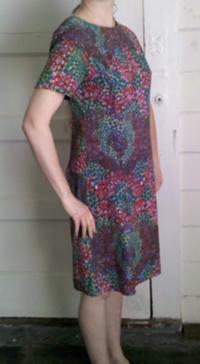 I made the dress without any alterations to the pattern, since the standard body measurements were correct for me. I didn’t even bother to shorten the back waist length by the usual inch, since the fit looks so tubular. I did this partially since I have made several A-line dresses in the past and they turned out bell-shaped, gigantic and tent-like – see the photos of Style 3070, at the end of this post. Actually, the fit is pretty good, and if I made McCall’s 2481 again, I would make it slightly bigger all around, especially in the hip and skirt by two or three inches. By adding just a few inches, I’d be careful to maintain the A-line, without going in to a flared skirt. I would also shorten the back waist length by an inch and a half. The center front seam contributes slightly to the bust shaping, which is a nice touch that is visible in the small plaid. When the darts come out of princess seams, it can be a hassle to alter, so I was relieved that they fit right exactly as the pattern had them. Another interesting feature is that when the dress is viewed from the front the skirt appears pretty straight up and down, but view it from the side and the fullness of the skirt is all in the back. I sometimes have to alter patterns for a sway back, but this pattern can easily accommodate a sway back, even as snug as this size is on me. I’m thinking that my next version of this dress will be two-toned, in one way or another. I’m leaning towards dark blue and green. 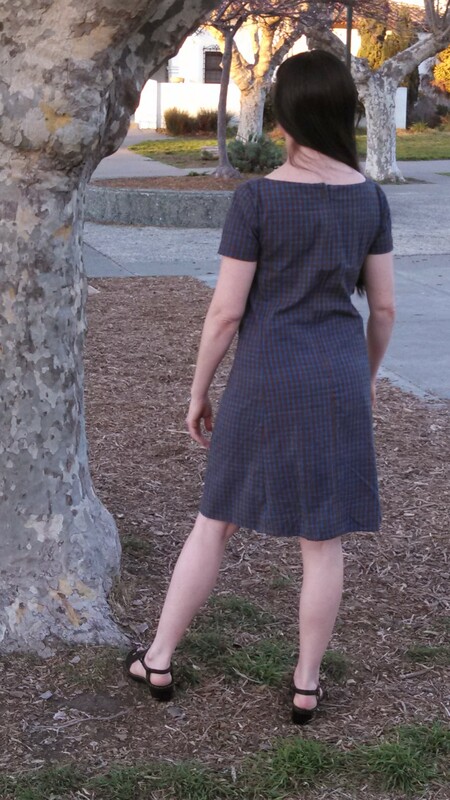 Side, vintage McCall’s 2481 in cotton flannel. It was bright, and I’ll try not to squint next time. 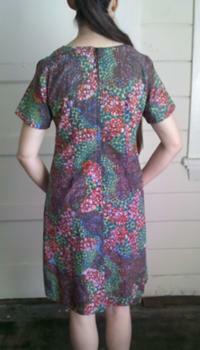 Back, vintage McCall’s 2481 in cotton flannel. A while back, I made the A-line dress below. I’m showing it here as an example of how illustrations and standard body measurements are often horribly, horribly wrong. 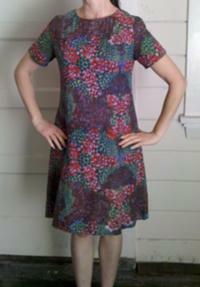 This is one of the patterns I mentioned above with sizing so far off that is more of a tent dress than an A-line dress. 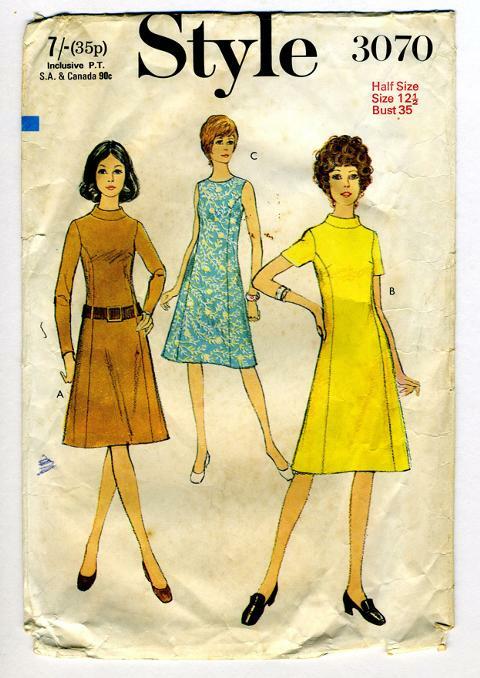 Style 3070 vintage sewing pattern, also from 1970. The sizing runs large – there is at least 3 to 4 inches of ease beyond normal! This is not a slim cut dress. The illustration looks like a slim cut dress, but it is not. My bust measures three inches larger than standard body measurement for the size, and there is still plenty of ease in the bust. If my bust had been the actual measurement quoted for the size, presumably the dress would have been about six or seven inches too big in that area. My waist and hip are the exact measure of the size, but the dress is tent-like in these areas – easily four or five inches too big, if not more. The illustration looks like it has relaxed semi-cap sleeves, but the actual sleeves are certainly not cap sleeves at all, and they bunch up under the arms like t-shirt sleeves. It might not be obvious in the images, but this dress is huge. It could be a maternity dress. Aarg! Bad fit and grading problems! Front view, Style 3070 vintage sewing pattern, from 1970. I’m glad that I made it out of a cloth that I have no problem giving away. I altered it to fit me, wore it a few times, then took it back out to the original pattern sizing so that I could give it to someone who it would fit. 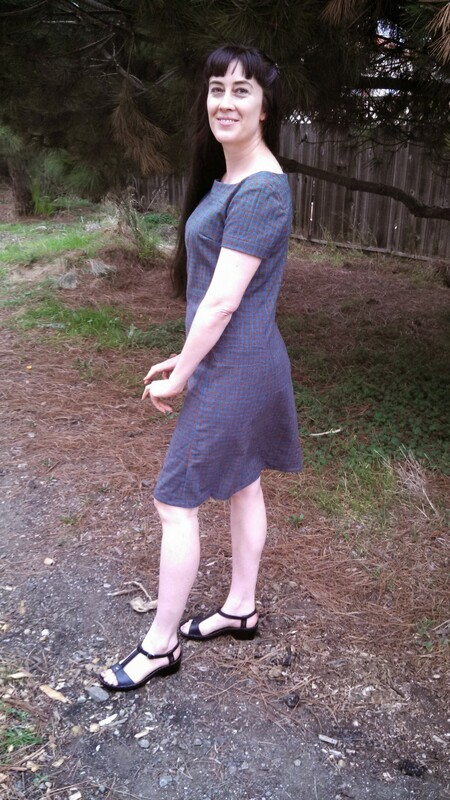 Since I had recently made several A-line dresses similarly oversized like this, I decided not to alter the McCall’s 2481 for the plaid flannel. The sizing looked about right on the standard body measurements and also when I measured the pattern pieces. And it was about right, so next time I’ll just make it slightly larger all around. Something must have gone wrong in the drafting of Style 3070, or some bad math involved in the pattern grading. Or maybe this pattern company always has this type of fit. For example, Burda sewing patterns are horrifically oversized and misshapen on me, even if the measurements are correct. In fact most contemporary sewing patterns have atrocious fit on me, and they are terrible, horrible nightmares to fix. The biggest problem is the wrong armscye fit, but there is also the too-big shoulders, arms, back and waist. And, hip too small. What is left? The bust measurement is correct, but the fit all wrong, bunching above and below the bust. I’m much better off with vintage patterns or drafting my own. Style 3070. It might not be obvious in these images, but this dress is huge. It could be a maternity dress, there is so much extra cloth in the front. I wish that pattern companies would honor their own standard body charts. Or course, there is a different amount of ease for every style and era, and this is what creates fashion. But too often sewing patterns just do not fit at all, the grading is all wrong, and the body shape is all wrong. Fixing the size grading should not be that big of an issue – vintage patterns had it down and the how-to’s of grading is easy to look up in the most basic textbooks on pattern drafting and grading. Pattern companies should be able to do this, but they are not doing this now. Proportions are different up and down the size range – for example, compared to the smallest size, plus size women’s shoulders do not expand as much as the bust, waist, hip and arms. As sizes increase, garments do not lengthen as much as they widen. We need specialty sizing lines. I appreciate that it takes all body types to make up the world, and I would certainly appreciate it if I found sewing patterns or clothing marketed for a certain body type, for example “pear” or “apple” or “strawberry” body types. Since my lower body is a size or two larger than my upper body, it would save me a ton of time shopping or sewing if I could go straight to the “pear” section to get what I needed. A while back I was with a friend who had just tried on “Apple Bottoms” jeans in a thrift store, and they fit so perfectly and comfortably that she rushed home and purchased another pair that would become her favorite jeans for years. Imagine the thrill of it – after years of poorly fitting jeans, she finally found the perfect fit. We know what our fitting issues are, and we just want clothes to fit. I would love this type of sizing straightforwardness and I know many of my family members and friends would also. Back view, Style 3070 vintage sewing pattern, from 1970. I wonder what percentage of American women would appreciate this type of totally honest sizing as much as we do. Probably not very many or the sizing system would have been reformed and standardized. I hear that Vogue Patterns will soon be printing the finished garment measurements on their pattern envelopes and in catalogs, so that we can estimate ease and see the true fit. In her Open Letter to Vogue Patterns, Shams at Communing With Fabric brings up many of these fitting and grading issues. Although I have very different fitting issues, I heartily applaud her efforts. Because of these fitting issues, I always make wearable muslins of everything I sew. Then I make it fit as best as I can. 3/14/14 update: Gail G. on WeSewRetro.com has pointed out that my “Style pattern is a half size pattern… designed for a shorter more stocky mature figure than a typical Misses. It is an old time size you don’t see much any more.” This is very interesting, and, exactly what I was asking for: specialized pattern lines for specific body types. Thanks for your comments! Image | This entry was posted in Making Things, Sewing Vintage and tagged 1960s, 1970, 1970s, 60s, 70s, a-line, cotton, dress, dressmaking, easy, fast, flannel, McCalls 2481, mod, pattern alterations, pattern grading, plaid, retro, sewing, sewist, size standardization, vintage, vintage fashion, vintage pattern, vintage sewing. Bookmark the permalink. Kathy, thank you for your kind words. As for the T-strap shoes, they are very comfortable and good for walking. They are Ariat brand, “Atlantic” model. “Shalimar” is similar. I wear them to walk long distances, several miles at a stretch, and they are very comfortable and nice looking. The heel is firm and has just enough bounce. The brand is designed for “equestrian athletes.” My foot is unusually shaped, so if possible, you should try them on before buying. No problem. I know how hard it is to find comfortable shoes, and how great it is to have shoes that really work well. I got these shoes at a big discounter for about $30, and doing a quick search on Google shopping I found them for about $40. Or if you are willing to go with “gently used,” $10 to $12 on ebay. The heel is pretty wide at the bottom (see illustrations at the company site), and has rubber grips on the bottom, but it is pretty firm on your heel, so trying on in a store is a good idea.